A couple of weeks ago, the phone rang at 7am. Now you know just as well as I do that almost nothing good comes from unexpected phone calls before 9am and after 10pm and this was no exception. It was my husband, calling me from work. He asked me to turn the news on and wait for a story about the woman in our area who was killed by a lightning strike at the beach the night before. I recognized her last name when the news report came on. Turns out that she was the wife of one of my husband’s coworkers. Very sad. But here’s the part that gave me chills. Heavy storms had moved through the area the night before, but nothing more than typical summer rain that we get every year. I remember watching the sky darken and being glad I was inside, but beyond that, I didn’t really think much of it at the time. While I was safe inside, she had been walking on the beach with her friend. She was struck and killed around 6pm. At that same time, her husband (I’ll call him Bill) was right outside my husband’s office door at work, chatting with another coworker. They were joking and laughing about something or another, being quite boisterous in fact. My husband remembered the time very clearly since he was getting ready to leave for a ballgame and had to close his office door to change clothes. After I watched the news, I wondered if it occurred to Bill after the fact that he had been happily oblivious to the nightmare that awaited him…that while he was exchanging jokes and cutting up, his wife was lying lifeless in the sand. I wonder if it adds to his grief, the fact that he was enjoying himself so in the last minutes of her life, or if it brings him comfort to have had a moment of joy before such devastating sorrow. I wonder if he regrets not calling his wife one more time instead of stopping in the hall or if he considers the way he spent his time that last evening of her life as wasteful. I don’t say any of this to judge him – after all, how was he to know? How are any of us to know when tragedy looms unseen around the corner? I say it because I think it’s natural to examine those last exchanges, those “where were you when it happened” moments and to think that maybe the universe would have or should have given you a clue that this day was not like the others. That this was a serious day, that different choices needed to be made. That time was short. But the universe doesn’t do that. It just rolls on, unconcerned with the stuff of human life. What’s even more strange about this story is that I used to work for the same company as my husband several years ago. Not long after I started there, a group of employees were playing golf and out of a relatively clear sky came a lightning strike. It killed two of the golfers, one of whom happened to be a very good friend of my boss’s. I remember it clearly because it affected my boss so much and because his friend left behind small children. At the time, my son was just a baby and I remember thinking that life can be so cruel to take away a father and leave his babies to grow up without him. And I remember thinking that something just as random and deadly could have easily happened to me or to my husband. It made me respect the power of lightning even more – probably a good thing since I live in the lightning capital of the world. And here’s where that story comes full circle. That golfer who died over a decade ago was also Bill’s best friend. 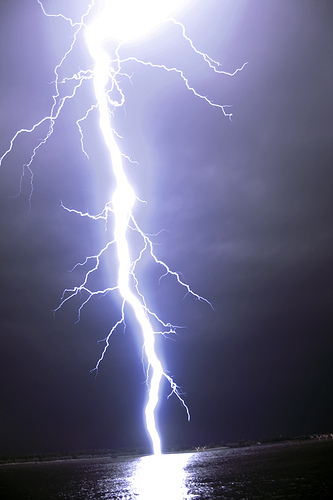 There are fewer than 3 dozen people killed on average each year by lightning. The odds have to be millions to one that one person would lose a best friend and a spouse to lightning in separate strikes. The randomness and improbability of this get at the messy core of life, which is that it’s unpredictable and completely beyond our control. As I type this, my kids are visiting with their grandmother. Earlier tonight, my husband and I took a walk around the neighborhood, talking and reconnecting. For a fleeting moment as we walked, I wondered what if something happened to my kids while they’re away – what if something is happening right now – and I’m just strolling through the neighborhood without a care? But then I thought that maybe living in the moment despite all of the hazards and sorrows that life can sling at us is perhaps the greatest gift of all. To be able to put away worries and move boldly into joy knowing that it can be snatched away in the most heartless way possible at any moment is living a life. I can only hope that when my time comes whenever and where ever that may be – hopefully long from now – my loved ones are busy living life and steeped in joy.